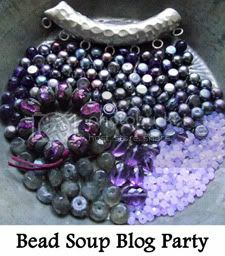 Regina's Writings: The 8th Annual Bead Soup PARTY! First a big thank you to Lori Anderson and her family for getting this wonderful party together. I can only imagine what it took to get to this day. Thank you Lori, you and your family will always be very, very special to all of us. Wishing you all strength, health and happy days. Remember the spectacular Copper Rose hand made by my partner Janice, it was a challenge finding the right beads to complement this head turner of a focal bead. In the end I used some beautiful Rose Quartz rondelles separated by copper spacers to make a simple necklace that did not detract from the rose! Simply glorious, I hope you like it! Next the carved pill box Turquoise beads; I wanted to keep it simple yet make it pop, so this is what I made... with mighty slabs of multi-colored Fancy Jasper. As you can see... keeping it simple... was the name of the game! Next on the list are the sky blue barrell beads of Magnesite and the granulated Copper spacers that were part of the bounty I received from Janice, and here is what I made... a memory wire bracelet with red Carnelian and Sardonyx. 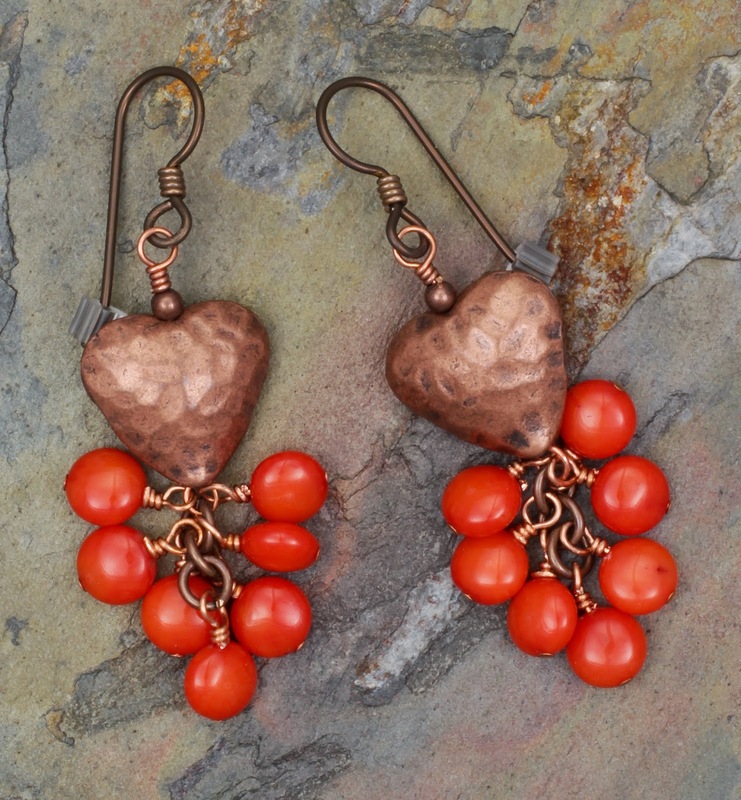 Some hammered Copper Hearts paired with little pills of red Coral and we have these pretties! And now I must confess that I could not do justice to the wonderful clasp that Janice had sent me. I know it is part of the rules that I use the clasp. And what a clasp it was, and nothing I could think of or design was to my satisfaction... so sadly I must save it for another time. The same shoud be said of the many Copper leaves Janice sent me... my mojo failed me. I think it was a combination of tax time fatigue and waiting till the last minute syndrome. Thank you Janice for these wonderful soup ingrediants, I hope I have not disappointed you. 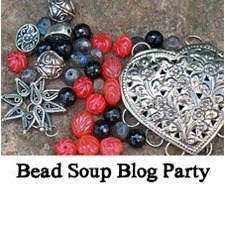 Please hop over to the Jewelry Room to see what Janice made with the Bead Soup I sent her. 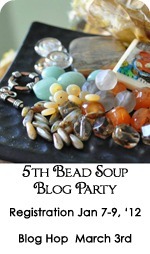 She has had some challenging times getting ready for this Bead Soup Party and I can't wait to see what she has made. Please visit the other 8th annual bead soup participants to see their wonderful creations by clicking here. A very Happy Mother's Day to all beader Mothers and Mothers of beaders! I adore the simple design with the gorgeour focal, the first necklace! Beautiful colours in that bracelet! And the earrings are lovely too! Well done, my dear! Regina you chose the perfect compliment to that lovely copper flower. That necklace is beautiful. I like the turquoise, carnelian, and sardonyx color combo and the red and copper earrings too.Great job designing. Elegant pieces - I can just see a business woman in them. Disappoint? With these creations...not even possible. I absolutely love the rose necklace. I almost set a stone in it and decided against it to give more options. I'm so glad I did. I love your version. The bracelet and earrings are big hits too. I love how differently you used everything than I would have. Just a quick note to clarify. The hearts I sent aren't handmade. 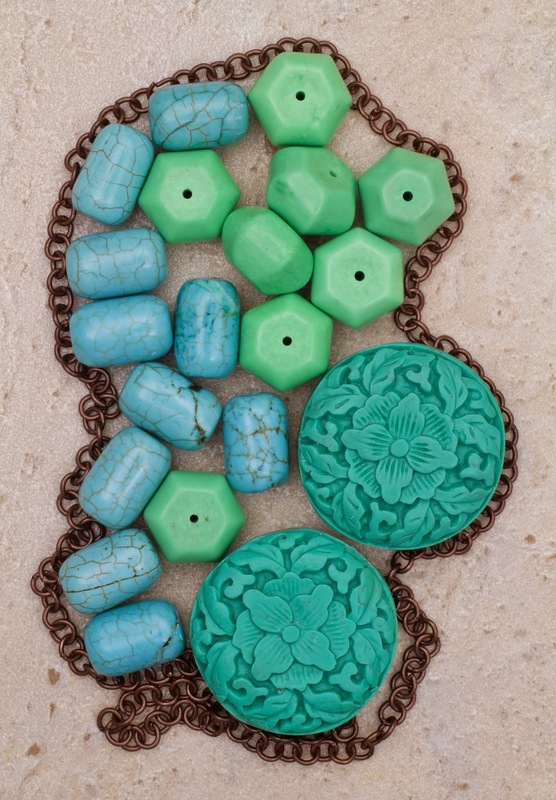 And the barrel beads are turquoise dyed magnesite. Thank you Janice, I have made the corrections. Glad you like what I did with your gifts. Thank you all for the lovely comments. great rose necklace and heart earrings- so elegant! 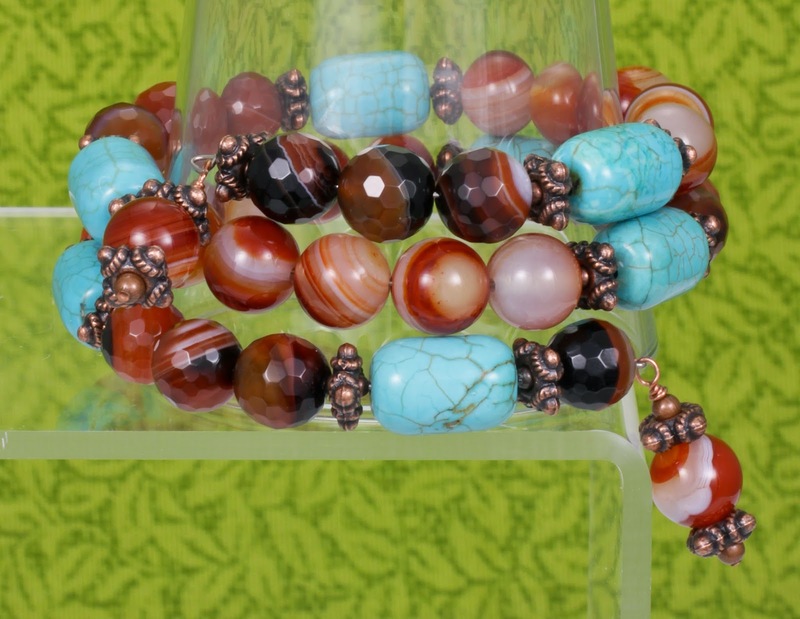 everything is lovely, but the turquoise & jasper is fabulous! Love your designs! Memory wire is the best for those of us that are clasp challenged! The rose quartz really does compliment that gorgeous rose, and i love the copper heart earrings. Lots of fabulous designs. 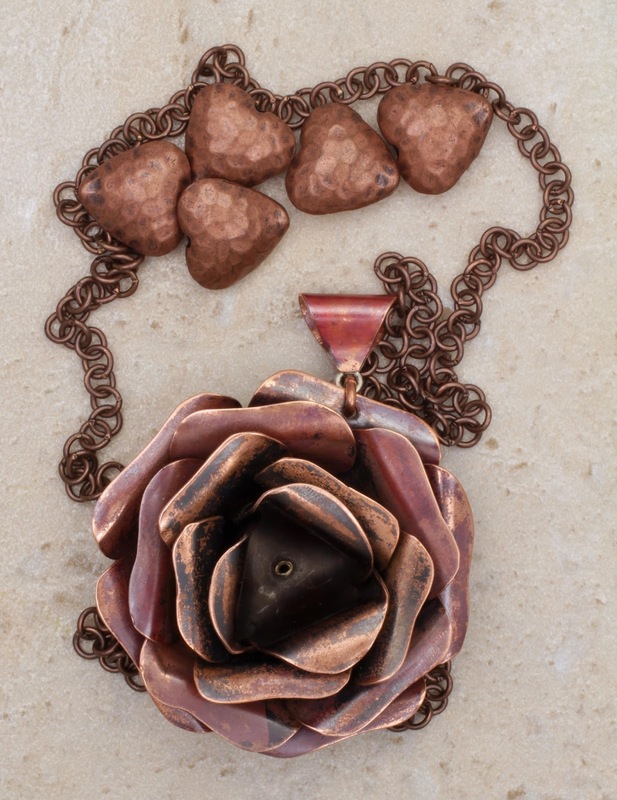 Absolutely love the copper rose necklace. You did it justice. I do love that copper rose necklace. And I, too, like to keep things simple. Those earrings are beautiful also. I wouldn't say 'simple', all the pieces are elegant and beautifully showcasing exactly the part you want it. Beautiful work! You totally did that rose justice ! And the other pieces are lovely, too ! All of your designs are beautiful! Great job with your soup, Regina!! Simplicity is spectacular, when it's done well like you did! 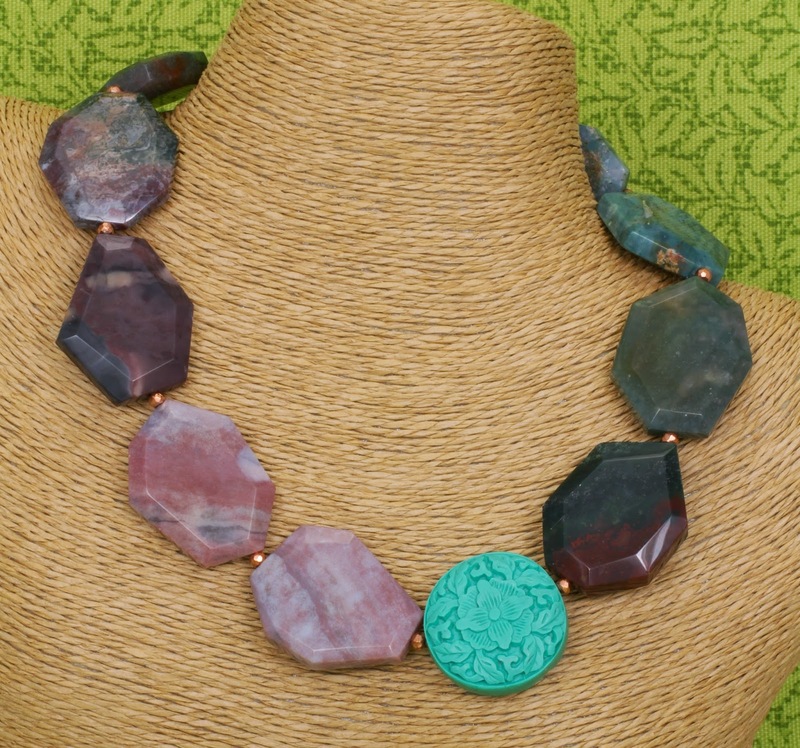 The necklace with the jasper slabs is stunning,and the rest of the pieces are beautiful, too. Beautiful work Regina. Love the way you put everything together. I love the simplicity of your designs. That rose necklace is so feminine and elegant. The earrings are lovely too. such wearable pieces. I think you did a fabulous job with your soup. and don't worry about the clasp.. sometimes inspiration hits us at the weirdest times and not when you need it to. Love it when one can keep it simple!! that is hard for me!! you did it all beautifully!!! Everything is beautiful. My favourite is the bracelet. what a clour combination. So great! Hi Regina! Even thought the long list is extremely overwhelming to me, I just had to search out my very first ever bead soup partner!!! Your designs are simply lovely, I have the idea that when I have an amazing focal, such as that of the copper rose you were gifted, that the design should be focused on that. So I think what you did with the rose quartz is perfect! I love fancy jasper with the bright turquoise carved piece, it really does make it pop! Everything is so beautiful it is hard to pick my favorite! That first necklace is simply stunning. I can see dressing it up with a little black dress or wearing it with jeans and a blouse. Spectacular. Beautiful how you kept it simple. You made the gorgeous beads stand out in your designs. The colors you chose are just perfect! The rose quartz was perfect for the copper flower...very pretty! Keeping things simple is often the best way to go! Beautiful job, they little copper hearts with the pop of red gorgeous! Sweet & elegant designs, ♥great use of colours! Fabulous designs. Loving the memory wire bracelet! But all of them are delightful! Really Soup-er. that rose necklace is really stunning, I love how you kept it so simple indeed, good choice, that rose now really stands out! Love your other pieces too, especially the memory wire bracelet, yummm! Really lovely designs! 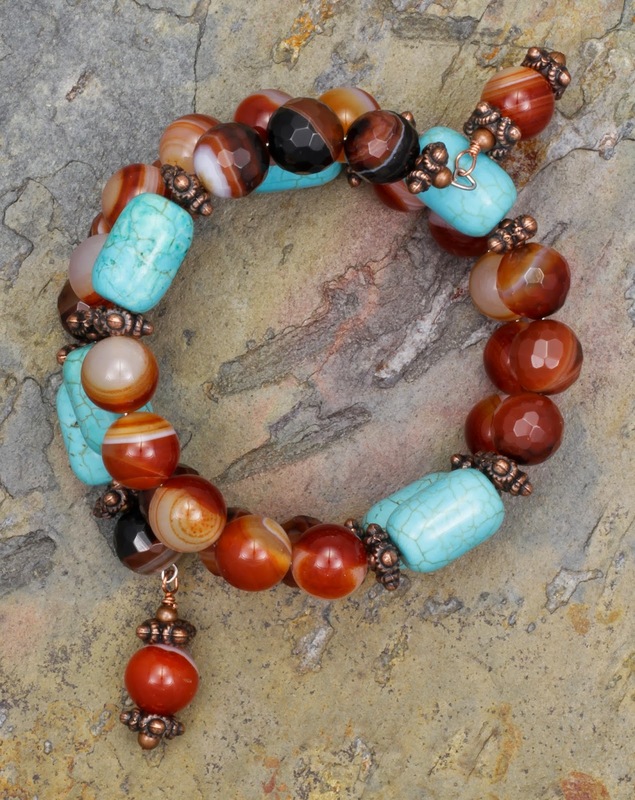 I love the "simple" contrast between the carved turquoise bead and the jasper slabs, both in shape and color. Really stunning! 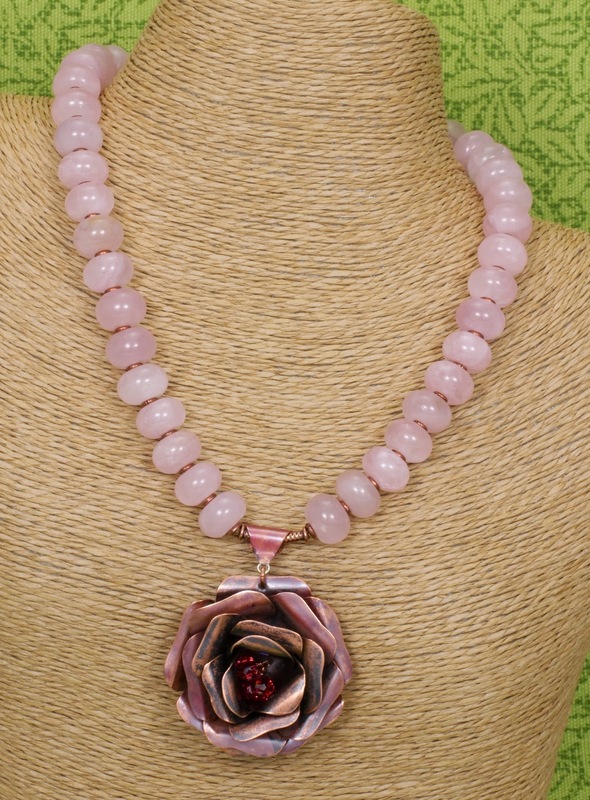 The pink necklace is perfect for that focal. Everything is gorgeous and I am especially fond of the wrap bracelet. Turquoise blue with red-orange is one of my favorite combos. All of your pieces are lovely! The elegance of the rose piece really calls to me, but also love the simplicity of the stone memory wire bracelet! Everything looks great. I especially like the bracelet and your choice of rose quartz on the first piece. Those beads compliment the copper rose perfectly! Love the hammered copper hearts. And the memory wire bracelet. Bellisimo! These are lovely! I love the pillbox jasper necklace. ok-I love them all including the bracelet, but the simplicity of the flat beads really lets the beauty of the beads shine through. Great job! Wow this is stunning! I love how you used the rose quartz with the copper rose its beautiful, so is the Jasper slab necklace and the bracelet looks wonderful! All of your pieces are wonderful - and I think you did the right thing in keeping them simple, so as to showcase those focals to their best advantage. The heart earrings are completely adorable! Well done! 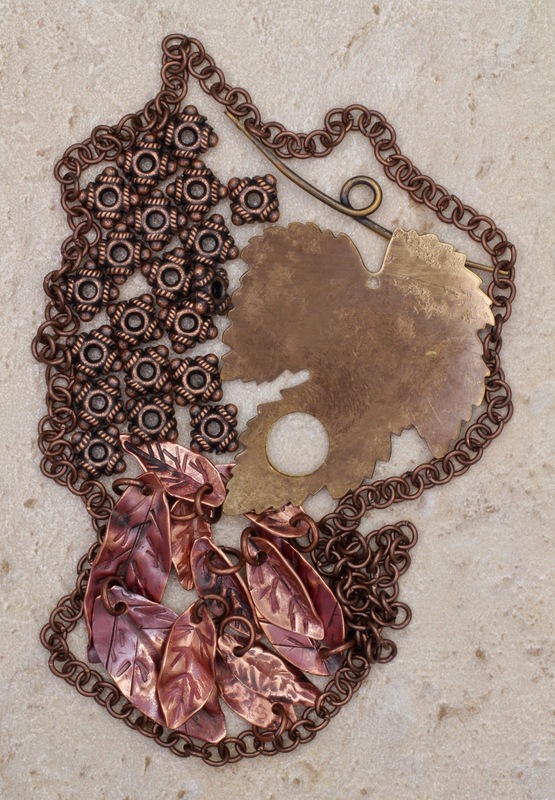 Beautiful work - I so love the copper heart earrings! I love the copper and red earrings. I really love the bracelt! That rose necklace is a stunner! All of your pieces show a wonderful sense of color. Love the memory wire,one of my favorite stringing mediums. I am sure your partner is so very proud of what you did with your her soup and I know she want mind that you were unable to use the beautiful leave toggle she sent you. Later when you are able to use it you could just send her a picture of what you accomplished with it. I love all the pieces you made. The was you used the turquoise was a pleasant surprise and it does pop nicely. The earrings are so sweet. Just all of it is extremely wearable for sure...ty for sharing with us all, bye for now and I hope you don't mind that I joined your blog. Each piece is lovely. You did a great job of showcasing the stunning flower focal. I would definitely wear the bracelet - great combination of beads. I was really wondering what you were going to make with that gorgeous focal. I just love what you came up with. Your design really highlights the focal and doesn't fade into the background. Beautiful necklace! What pretty earrings - the hearts and red beads. Very warm tones. Love the rose quartz with the copper rose. Great work. Wow, Regina...you and Janice were very well matched, I would consider you each masters of colour. Gorgeous pieces you made, all of them; and I love the simplicity, it's perfect. The colour of those rondelles with that flower focal...just wow. Fantastic pieces!! Great stuff. You really set off both the focal and the turquoise bead. The slab necklace is fantastic. You did a Great job with all of the fabulous beads in your soup!! 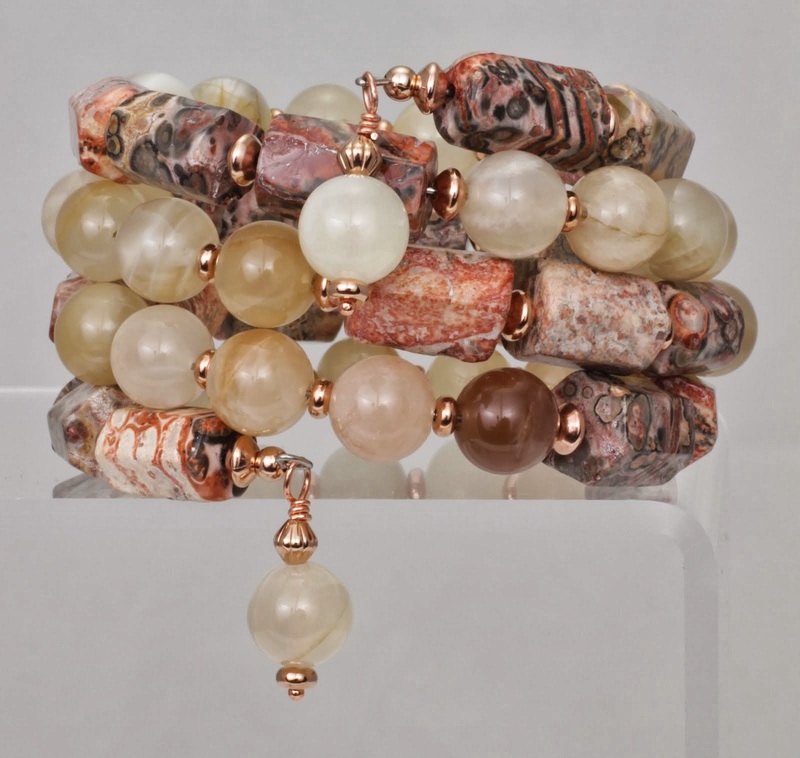 !The rose quartz and copper rose are wonderful, the wrap bracelet is wonderful!!! I just love them all!!! Have a Blessed Day! All your pieces speak to me, they are beautiful, I love the large bead necklace...what a statement! Lovely designs! You've created some stunning pieces! The rose quartz really showcases the handmade copper rose! 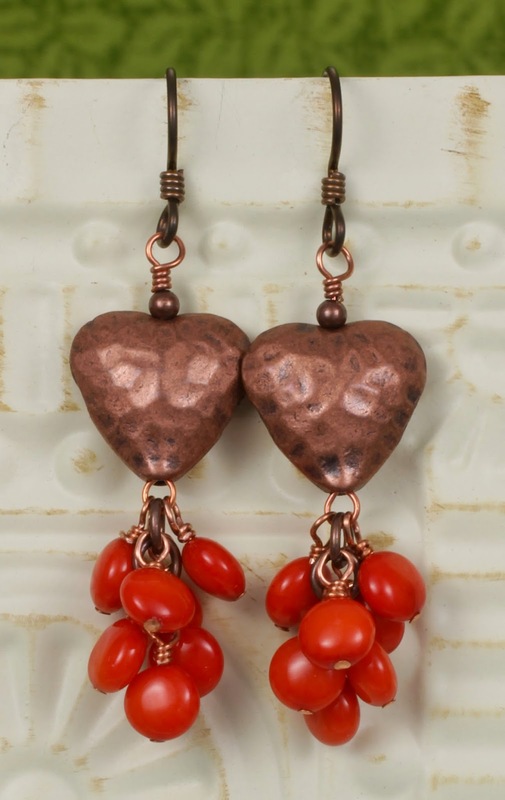 Love the whimsical copper heart earrings with the dangling red M&M's. Memory wire combo of colors is such fun! Love those stones. The slabs of jasper necklace is stunning as well! Very enjoyable soup!!! Nice job!!! Gorgeous Rose! Love that you went simple with it. Great soup! Your creations exude a certain elegance. I love how you use colours. Very lovely. Love that copper focal! 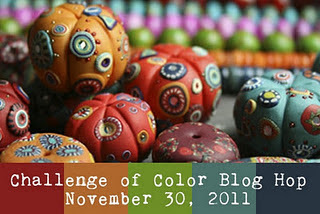 Nice color combinations and designs! Beautiful pieces. The Rose necklace is just lovely, so elegant. Great job. Love that you kept it simple yet showcased the beads so well. the wrap bracelet is great. Can't wait to see what you do with that clasp! You made some lovely pieces. My favorite are the earrings. Copper and orange - yumm! Great job! omg - that copper rose is amazing! Lucky you! The simple combination of rose quartz and copper spacers is perfect with it. Your other pieces are great too. Can't wait to see what you do with the clasp! First off, I think it's great that you kept this post short and sweet! As for your designs they are really lovely. That rose necklace especially catches my eye! Great work. If you see something that you would like to buy from Sundancegems, please mention that you are a follower of my blog and use the code BLOGPAL to get a 20% discount on your purchase price. Discount programs cannot be combined, but I will get you the best deal. Thank you for visiting Sundancegems. Enjoy! Regina. I am a beader! I love beads! I have been beading for about six years now and seeking to share my experience with others and expand my knowledge of beads, beading techniques, and have fun along the way. Check out my Frosty Berries! Etsy's InCrowdTeam Jo's Jewels Speaks Up!